Having decided to find a few more pubs with Jukes, the best place to start, is with (IMHO) the best Jukebox in town. 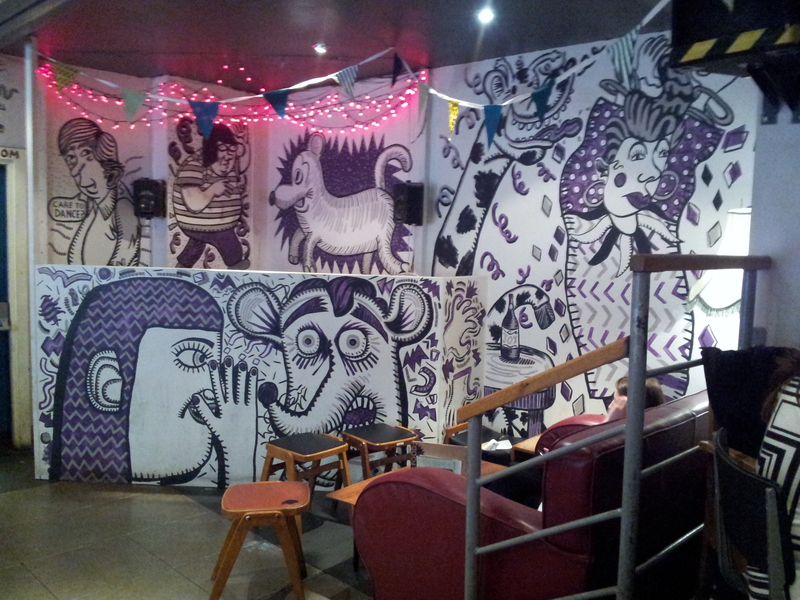 Which also happens to be in a cracking bar. Cask. Cask is a wee bit like the Tardis. Small and blue on the outside, but deceptively spacious on the inside. 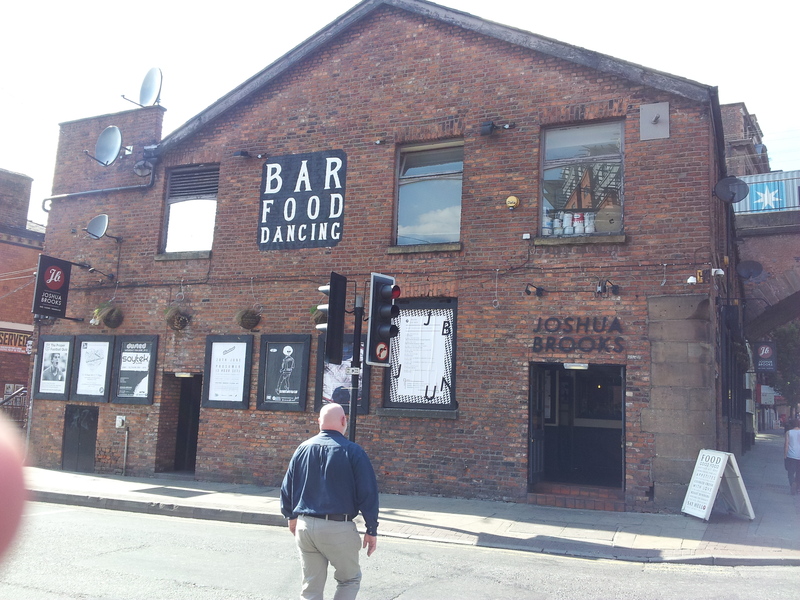 Located at 29, Liverpool Road on the edge of the trendy Castlefield district, It’s like a little slice of audio heaven with one of the most eclectic jukeboxes I know. In my opinion, it has no rival in Manchester. On striding in, Col & I were confronted with 3 ales (the bar being immediately in front of you as you enter via the corner doors). Col went for the Celt Experience beer Iron Age, I chose Citraville APA (3.9% abv) from Ole Slewfoot Brewery from North Walsham, Norfolk (a brewery I was yet to taste) the other beer being from Dentons’ own Hornbeam (Summer IPA). The Citraville (as the name implied) used the citra hop to create a gentle grapefruit citrus aroma and a mouthful of restrained pithy grapefruit hop with a touch of biscuit sweetness for balance. A cracking start on the beer front indeed. I have been in this bar plenty of times, but not frequently enough recently. 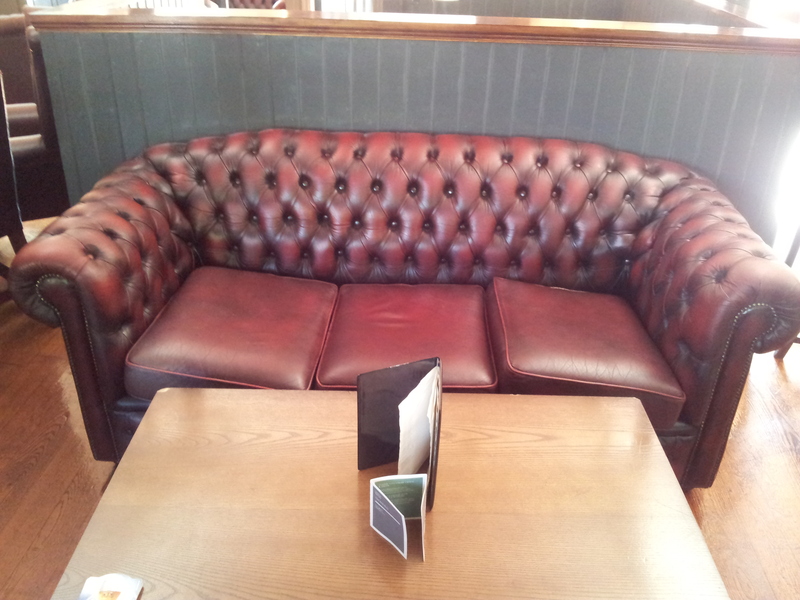 However, on each occasion, I had never had a seat beyond the bar area. Tonight, I boldly went where………. The place really opens up in this back room, in more ways than one. There is a lovely canopied patio area / beer garden outside which was well populated and quite a few tables with comfy chairs in here. And BOOKS, games as well (Connect 4 anyone? No? Cowards!!!) a brave book selection as some of them were of recent vintage, proven as Col perused the James May & Oz Clarke beer book! Whilst not exactly being a multi-roomed pub, the three distinct areas (including the beer garden) provide a little something for everyone. As stated, the beer was superb, the tunes? Great Juke with plenty of roots reggae, loads of eclectic indie, bit of rock, a really good selection and my shout for best in town. My tunes were Odessa by Caribou from the Swim album (a surprise & a particular favourite) and Morning Rain from Manchesters’ own I Am Kloot from the Natural History album. Tunes both! By this time, we had been joined by my arch nemesis (also enjoying an Ole Slewfoot) and it was time to move onward…. (via the excellent chippy next door!) to…. 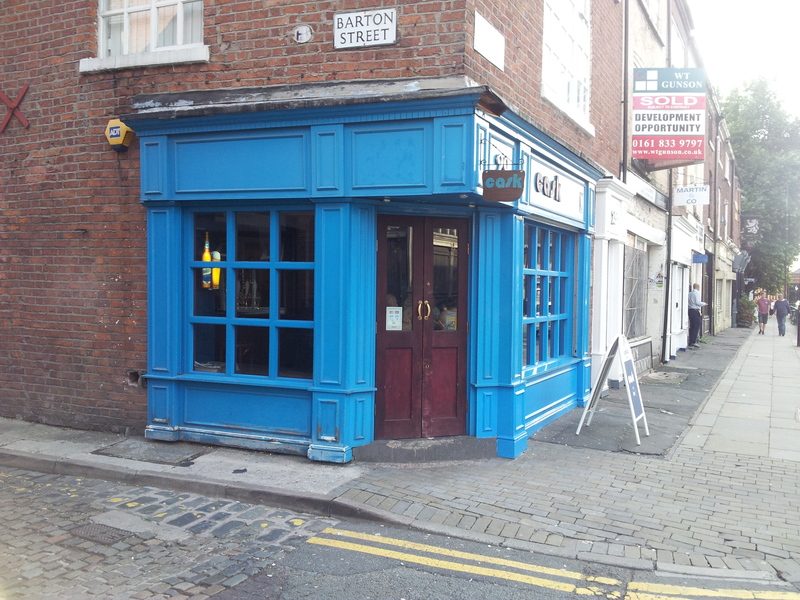 Now a Manchester institution located at the top end of Deansgate near the junction with Whitworth St, famed both for its beers and the superb food served, The Knott is justly popular. With the 3 of us striding in on this sunny evening (yes, this IS Manchester. Honest! ), we headed straight for the bar. Another good selection including beers from Oakham (Green Devil IPA), Magic Rock (High Wire) and Hawkshead amongst others. I went for a beer I was yet to sample from Hawkshead. Bitter. A golden beer with a lightly floral nose (reminding me of the Sorachi Ace hop) led to a refreshing light fruity beer with a nice floral and bitter dry finish. A lovely beer for a summers evening. At this point, we had a bit of leg work to do. 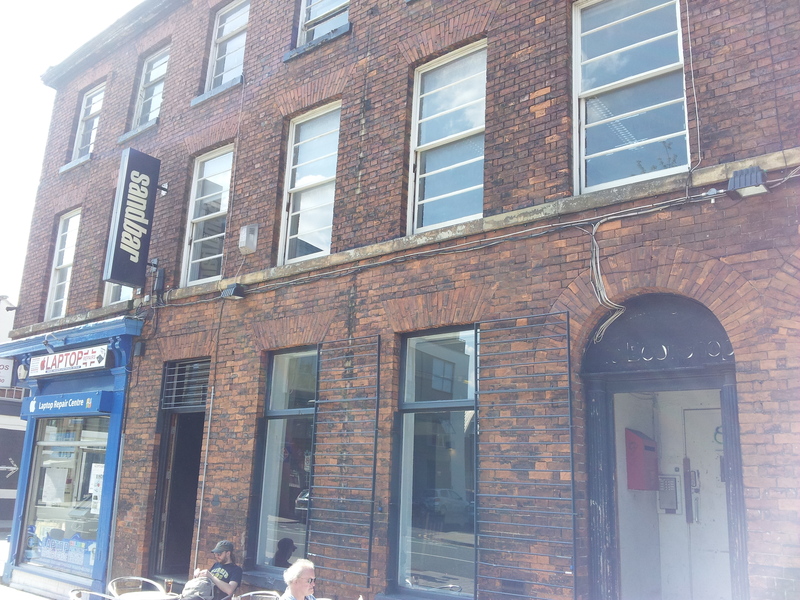 Walking up Whitworth St and bypassing the many arch inhabiting bars thereon, we walked past the Hacienda Apartments and bemoaned the loss of that once great club, when, on nights like these, some wag would always open the rear door onto the canal and cool down in the murky water! Turning up the back streets, bypassing Font (sighs!) 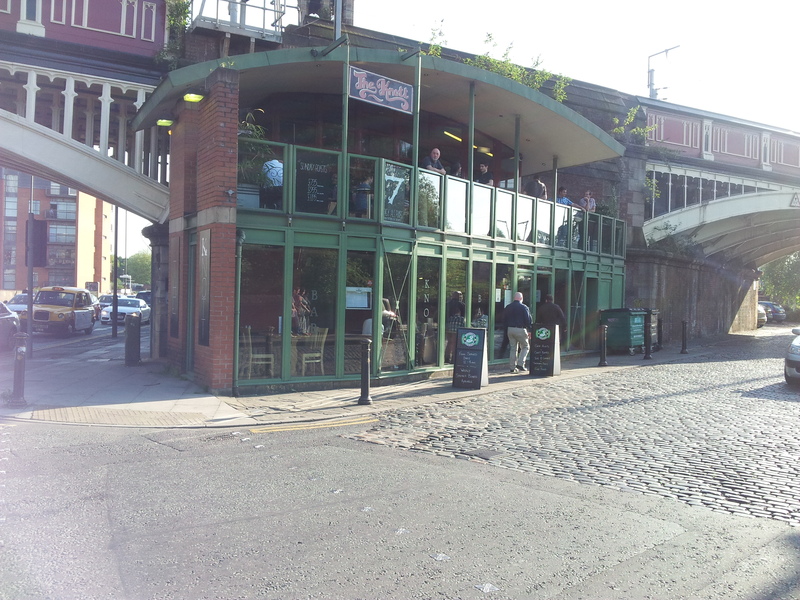 we were destined for another railway arch, this time occupied by a bar I was yet to try. Being inside a railway arch, the bar opens out to left and right as you approach the bar. The performance stage is to the right of the bar as you enter. 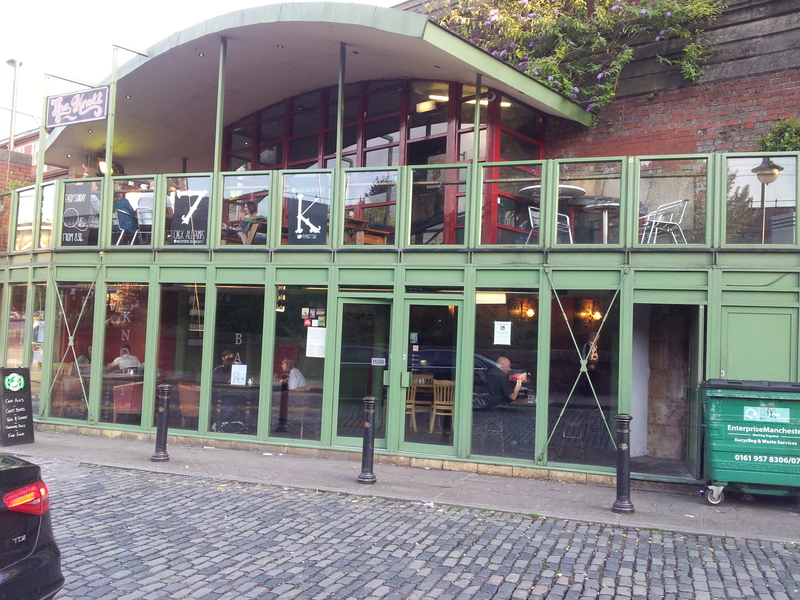 Quite a nice wee place really with a rep for live music (which was for free BTW) but with DJs at weekends. Glad I popped in. Hardly a chore of course! No juke but as usual, great tunes. Obviously not as busy as at weekends, the bar was easily gained as my eyes lit up! Pale Ale by Five Points Brewing! Easy decision that then! Gold and slightly hazy. A sharp grapefruit and fruity mango nose on this puppy. Grapefruit upfront in the mouth with a touch of malt sweetness for balance. A short bitter and hoppy fruity finish. This was packed with flavour, far more than any beer at 4.4% abv has a right to. A really zingy refreshing beer. Beer of the evening for me. Not been in here for 20 odd years! Used to be a really good boozer this, with reliable selection of good ales. 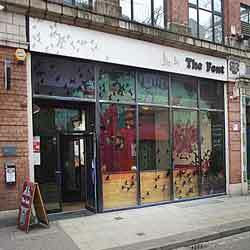 Located on Wakefield Street, just down a dip off Oxford Road, you could easily miss this. Handy for Oxford Rd train station though, as steps lead up to it from outside the pub! Another single space with a multi room feel. Bar and some seating to the left on entry with the room stretching out ahead. There is a rare red cloth pool table to the right facing the bar. 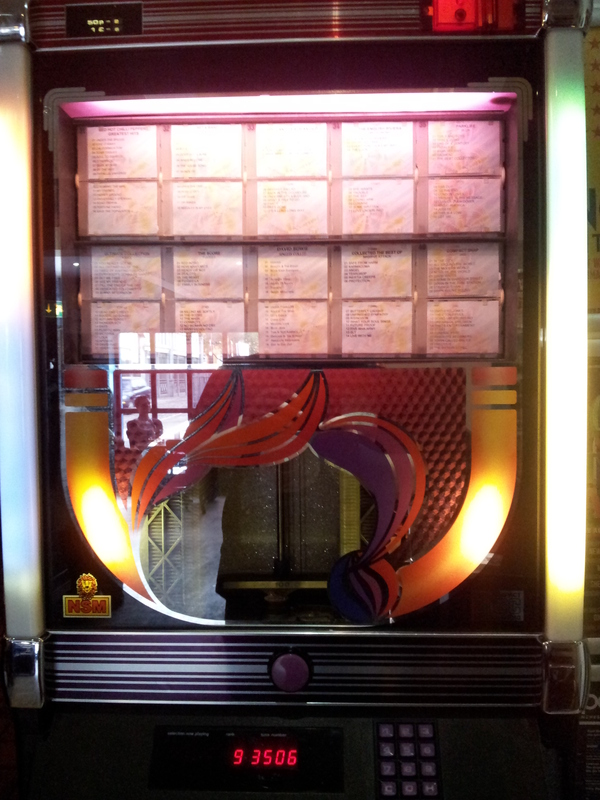 The jukebox (unfortunately digital and modern in design) has a distinct rock/metal bias. This does have a rep as a “Rock” pub. No bad thing! I grabbed a pint of All American Summer Pale from Caledonian at 4.1%. The beer was uninspiring. IN good condition, with a vaguely fruity nose and flavour, NOT what I was expecting from the words “All American”. Hops were called for, and unfortunately were not present in sufficient numbers for me. Nice enough, but bland. Friends, music & beer. A good evening. The original idea was set some time previous. 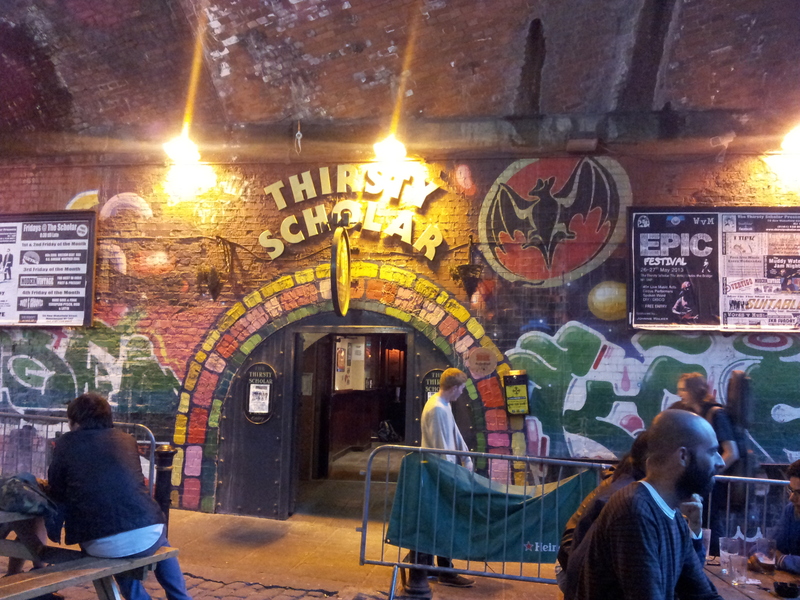 A colleague wanted to see some of Manchester’s better pubs/bars. As you will see, at least I had a good time! Word got out of a Works do at Dukes 92. I couldn’t do it. Whenever I had been there, the beer was simply awful. Arrangements were made to meet afterwards. Needless to say, they didn’t quite work out. Hey ho. There was beer to be drunk, so I obliged! The afternoon starts off in…. Having not been for a while, seemed like a good place tp kick off…. Being a lovely bright sunny day, there were tables outside. What’s more, there were people sat at them! Warm outside, but nice and cool inside with 7 (seven) handpumps on display. As you can see below, an excellent selection. However, I had eyes for a beer I’d had only once before. Tarantula by Privateer. Sandbar effectively has 3 room. A large room where the bar resides and two rooms to the rear, which were formed from the addition of the next door premises. Being fairly early in the afternoon, these were quiet. 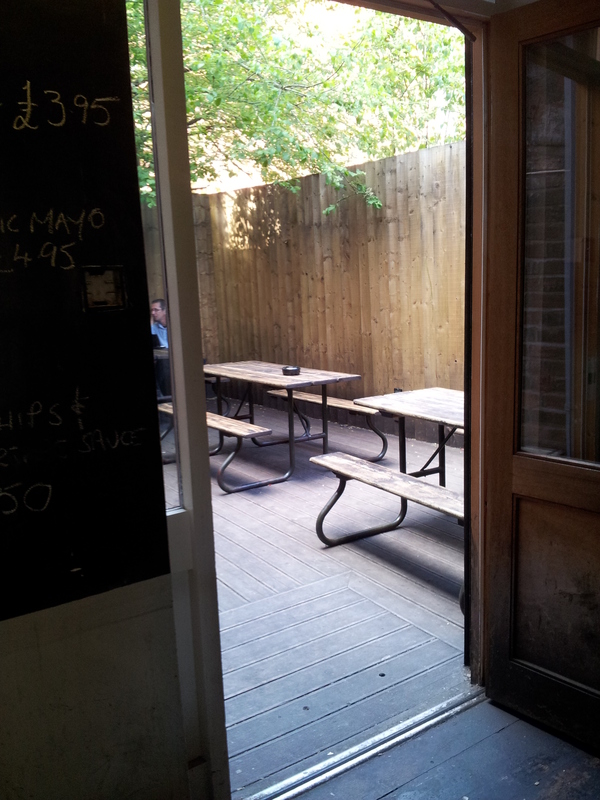 A nice sized beer garden to the end of the bar was enjoyed by a few sunseekers. Following the Tarantula, decision time. Redacre by Worth Brewery (from Poynton). A 4% deep copper coloured beer. A gently floral aroma was followed by a fruity mouthful, bitter with an increasingly dry herbal grassy finish. Not usually my kind of beer, but nice enough. Each time I see Sandbar, there’s something else that impresses me. 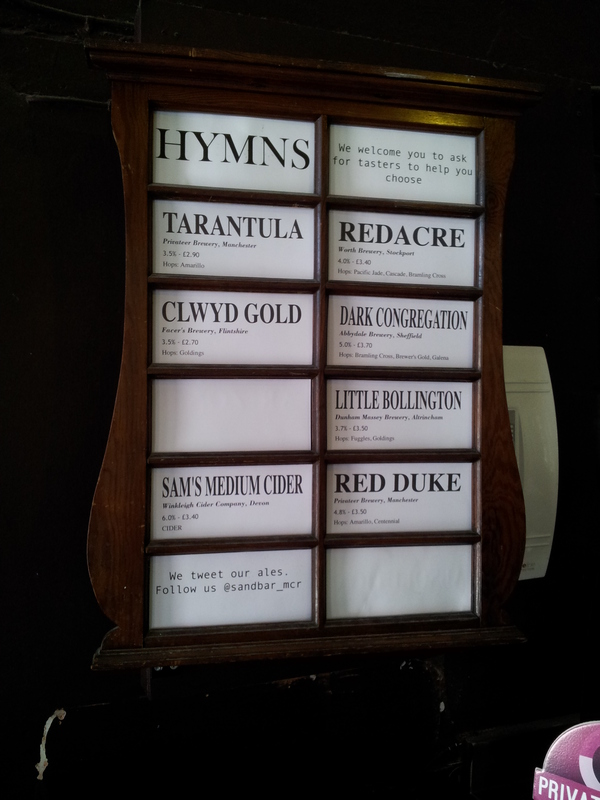 Today, spotting an excellent jukebox and the notes on the “prayer board” listing the hops used in each beer. A nice touch. Nice friendly bar staff too! Ordinarily, I would have loved to have stayed, but word had reached me of other beers that needed sampling elsewhere….that elsewhere was….? Again, quite a few people sat on the balcony overlooking the Medlock, enjoying the rays. Me, I had an alternative agenda! Canasta Mild from Black Jack Beers. A black beer, slight chocolate nose, lots of roasty stuff going on. Nice and creamy textured, with a dry coffee aftertaste. Another nice Manchester Mild. That Black jack went well with a lovely Lancashire Cheese and Onion pie from Great North Pie Co with a creamy side of mash. Just what the proverbial medical chap ordered! Next up, the US Saison from Quantum at 5% abv. I didn’t think this was being casked! Hazy golden coloured, this was a fruity mouthful with a pronounced peachy nose. Really peachy in the mouth too, more so than I remember from a couple of weeks ago. Refreshing, grassy dry finish. A big surprise this. Great tunes in here too. Gold Panda, Yeasayer. Works for me anyway! Let me repeat. £2.60 a pint. Every Friday! How many times do I have to repeat myself? Eh? With no James to mither, we moved on to…. Quite busy for the time of day, but still able to get a seat. Just the one here. For me, Black Perle from Weird Beard Brew Co. Only the second beer I’ve had from this Hanwell, West London brewer. And what a belter! A 4.5% abv Milk Coffee Stout. As in a Milk Stout with Coffee! Black, with a gentle coffee aroma. Slightly sweet with a firm coffee kick, this was a lovely creamy mouthful. The coffee in the mouth was like a nice filter, rather than the usual ristretto.It was all the better for it. The tunes in here were quite retro today. Walking in to Peaches by The Stranglers set the tone. Value was again superb in here. Use of the CAMRA membership rendered the Weird Beard and a pint of a 7.4% from Tempest down to £5.40. Floats MY boat! Hadn’t been for a while. The balcony was busy with sun seekers whilst the bar was fairly well populated also. First choice was Titanic Stout. 4.5% abv, this black beer is an old favourite and didn’t disappoint. Black beer with a beige cream head, this had a lovely smooth creamy texture with a full roasted body with a slight bitter coffee note. An excellent dry stout. Next up was Rapture from Magic Rock. At 4.6% abv, I love this beer and have had it on many occasions. It was in really good condition as well. As hoppy as you would like with a big grapefruity nose, good malty body with lots of hops. The balance is on the edge with this but just works so well! £3.80 a pint seemed a tad excessive though. The Castlefield effect I guess. Whilst the initial plan didn’t work out (though I tried! ), as you can tell from the above, the afternoon wasn’t wasted! In a pub with 5 handpumps. I drank tea! I stuck to my guns and steadfastly refused to drink the likes of Greene King IPA. So. On the final Saturday of 2012, I felt justified in seeking the welcoming warmth of hostelries with handpumps. And good beer. Having met Jeff for the first time in many a year a couple of months back, (and discovering a mutual love of quality beer) there was an outing planned for Manchester. A quick check of my diary revealed a family do that afternoon. Having negotiated my exit strategy with my beloved Atilla, it was game on. So on this particular Saturday evening, I find myself on a bus, Manchester bound reading a text calling off the meet. What’s a thirsty boy to do? A quick call to my good friend (and frequent drinking companion) Mr Jaz and I find myself exiting the bus a couple of stops early and entering….. Walking up to the bar, there was only one pump occupied with a clip. However, a quick smile from Tom and he declaimed that he was busy putting two more ales on! 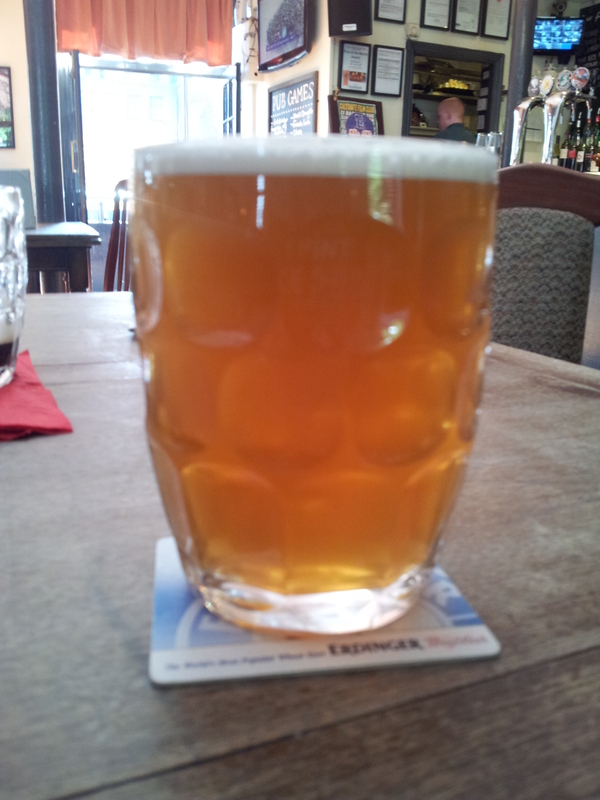 So, joining the 4Ts Brewery Magnc pale ale was, firstly, Salford Arms Ale by Black Jack Brewery. One of those for myself and a 4Ts for Mr Jaz secured, I settled down in a comfy leather chair and awaited my partner in crime. As per our last visit, Tom had said that the nice fellow at Black Jack was reformulating the beer to make it vegan. This had now been accomplished. I hadn’t had the ‘house ale’ previously and was really looking forward to it, so much so, that I didn’t wait to see what the second new ale going on was! As I started to sip the Salford Arms ale, Jaz walked in. (I had had a sneaky sip of the the 4Ts Magnc whilst waiting and it was a lovely pale beer with some complex hopping, spicy with some citrus but with a smooth malt base. A very nice beer which I will try again). The Salford Arms ale was superb. Pale as Kate Moss but with more body, it was lovely hoppy brew at 4.3% abv, nice juicy malt in there but the right side of hoppy and bitter. If I am going to drink pale beers, this is how I like them! Another excellent beer by Black Jack! Now. The plan was to have one and then move on. But, as you know, plans do indeed have a habit of changing. This one changed when Tom brought over a sample of the other beer that went on at the same time as the ‘house ale’. The beer was brewed by a recent addition to the Manchester brewing brotherhood Privateer. A quick sip showed that this was a beer that demanded further exploration. The beer was called Dark Revenge, was 4.5% abv and was appetisingly black! A lovely aroma combining chocolate and some coffee notes, the flavour was of a nice smooth dark roasted stout with a flavour that I got as subtly chocolate. Jaz detected more coffee than I did, but hey! I wasn’t complaining. This was my first beer from Privateer and with flavour as good as this, it won’t be my last! An excellent pint. 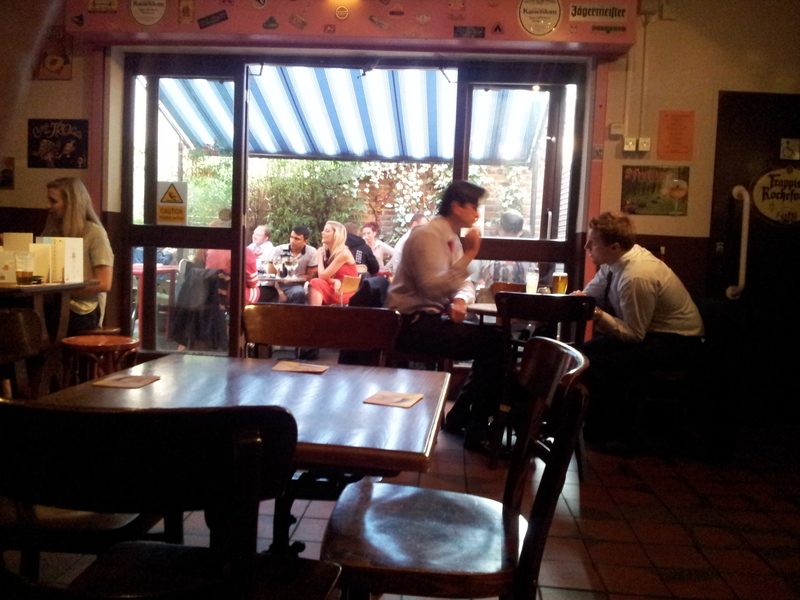 The pub was reasonably busy in this Xmas / New Year interlude and deservedly so. Tom has got the beer turning over really well and seems to feature local micros in the main (all 3 last night were local). An excellent pub. The night was enlivened at this point by a group of West Brom fans sat next to us. Beer lovers too. Passionately bemoaning the biased coverage on TV which only showed Man U and swearing that they were camped in opposition territory all second half. We had a chuckle indeed. We chatted about The Post Office Vaults (near New St Station in Birmingham centre) and they extolled the virtues of The Black Eagle in Hockley (now stored in the memory bank!) Nice blokes. We move on…. (a substantial stroll) to…. Really busy in here. 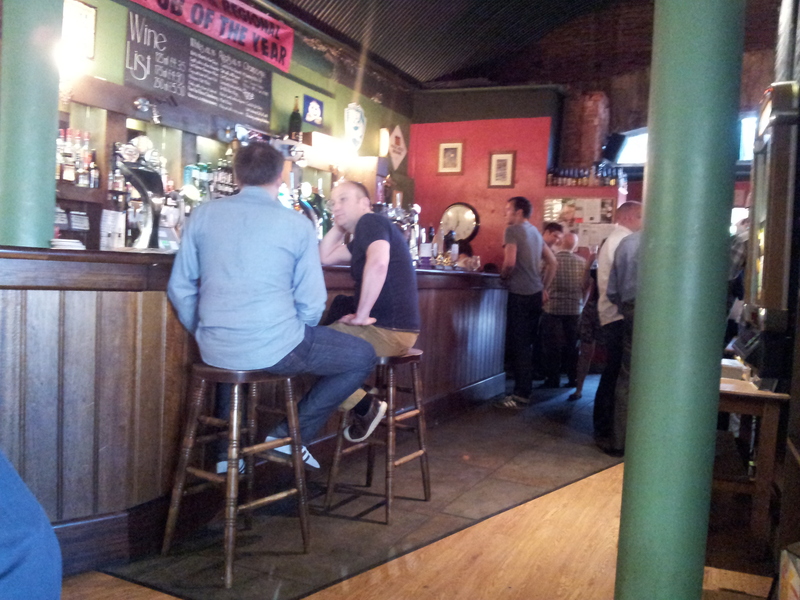 It was that busy and loud with conversation, that I could barely hear Manchesters’ greatest pub jukebox! Jaz had an Abbeydale whilst I latched onto the North Star Porter from Facers. I’ve drunk more Facers recently than I ever drank when they were located in Salford! The North Star has a nice roasted nose and a nice texture (not too thin at 4% abv) dark roasted coffee flavours and a touch of sweet chocolate. Excellent friendly bar staff again. Now at this point I got a phone call from Rob (see Castlefield Area Stroll) who was also looking for a pint having been at the same function as me earlier. The Facers Porter was a nice pint, but the were other pastures to graze upon. Next stop……. Pleasantly not quite as rammed as Cask, but busy enough, there were a couple of beers that caught my eye here, both at the higher end of the price range, but worth it. 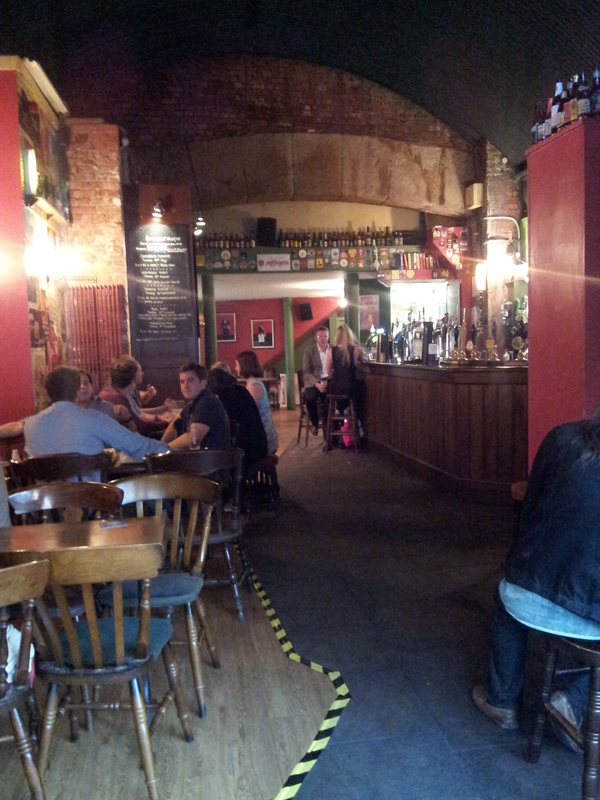 I left the Redwillow Shameless to have as a second pint in here and plumped for Thornbridge McConnells. 5% abv and £3.80 a pint, this was a lovely looking dark brown to black beer with a nice caramac (new colour!) coloured head. A little sweetness in the aroma led to a nice creamy stout. A lot of subtlety in here with no particularly dominant flavour. A touch of vanilla, some lovely smooth almost caramel chocolate roasted flavour from the malt. Just an excellent understated pint. I’m beginning to appreciate again that flavour doesn’t have to be an assault to be good. During this pint, Rob joined in the fun and after a quick update on the function fun, he too settled down to enjoying a pint of McConnells – I’m starting to think he’s gradually shifting to the Dark Side! The only slight disappointment came next. I was REALLY looking forward to a pint of Redwillow Shameless, the 5.9% abv Double Pale Ale. Unfortunately, as I’m draining the last of the Thornbridge, it ran out! Damn! Ah well, another pint of McConnells all round could barely be described as a hardship now, could it? Anyhow, after this dark interlude, I was in the mood for a final pint of dark pleasure (and we needed to head toward the bus station of course…) so, in the steady drizzle (and Rob without a jacket….!) we mosied on down to…. Anybody who knows me, knows what happens when we get here! There was a large selection of Xmassy type beers with typically Xmassy type ‘humourous’ names like Rogered Rudolf and the like. Maybe I’m a bit of an Eberneezer about such things. Just give me a beer name that gives me a hint as to the flavour and I’m content! Anywho, I’m a simple soul, with simple tastes. So, having the merest sniff of the JW Lees Plum Porter (which Rob pronounced as full of plum flavour), the cry went up “Paramount Porter Please“. 6.5% and (at this stage of the evening) with a texture that felt like black Angel Delight, this was my sleeping draught of choice! Glorious with some roasted cocoa bean action going on, there was a lop-sided smile on my face! As usual, quite busy in here and deservedly so. Until Next Time. And a Happy New Year to one and all! Feeling the need to stretch my legs (and my horizons! 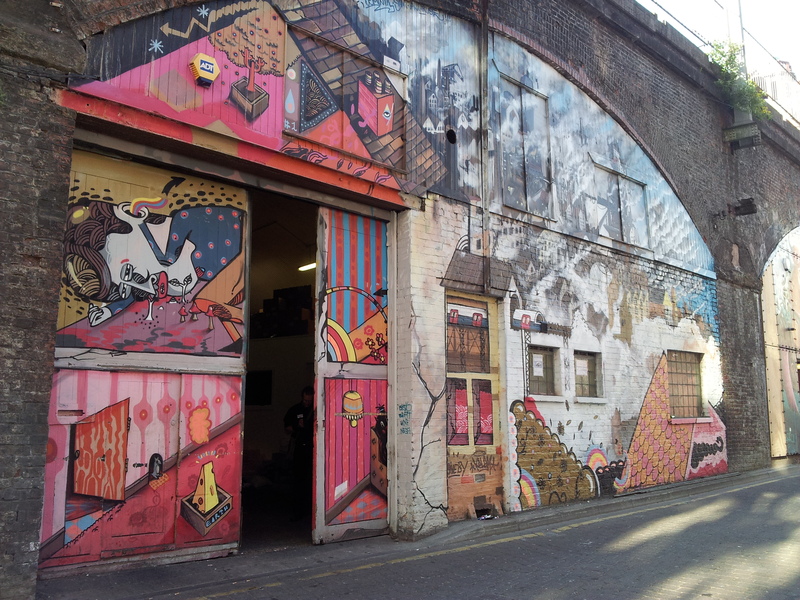 ), it was high time I left the comforting bosom of the Northern Quarter for something different. Initial consultations with the mighty Jaz (well, this IS a democracy!) settled my decision (Democracy, eh???) and Castlefield was chosen. Reasons being a) I hadn’t written about any of the bars yet, b) At least one that I hadn’t visited yet, and c) Simply because….ok? This time, in a slight twist to the usual, we had some company (Rob, Paul and Chris)! All my companions demontrated dedication to the cause, above and beyond…..the weather was FOUL! Being furthest away, the meeting point was The Wharf in Castlefield basin. Having never been before, it was strangely tricky to find for such a large building. What a trek! With there being 4 of us at this point, a traditional “whip” seemed in order. So off to the bar for 2 pints of a ginger flavoured beer from York Brewery, a pint of Weetwood Blonde and a Hornbeam Top Hop (mine). £14.50! Average over £3.60 a pint. This is expensive, even for Manchester. However, The Wharf patently must have its market. 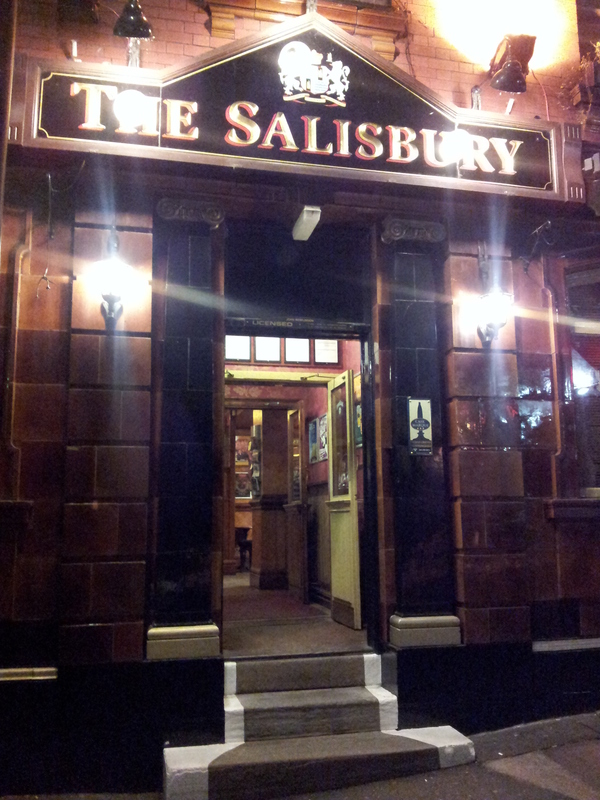 It certainly boasts a large selection of ales, having all 12 handpumps occupied, many with beers from local micros. For this, The Wharf is to be applauded. The Hornbeam was a nice mid-brown bitter, fragrant hops on the nose, quite hoppy flavour with a nice dry finish. An excellent start on the taste front. But £14.50……! We move on…. The Knott has been a favoured meeting point for my work associates for a number of years, owing to its excellent beers and good food. The prices are average for Town and it is an excellent meeting spot due to its proximity to both regional rail line (Deansgate) and Metrolink (GMex). Tonight it was reasonably busy for a Thursday. This was where we met Paul. Again, our Golfing game crew were here (the 8th hole) and some of them looked as if they were considerably “over par”! Settling down to beer selection, Jaz & I went for a Hardknott Cool Fusion. A pale beer at 4.4% abv with a hint of ginger in the nose. The beer texture was somewhat lifeless, strange given that it was dispensed via beer engine, rather than direct from cask. The beer flavour was excellent with ginger to the fore with plenty of malt balance. A fine beer. In common with most of the better bars in Manchester, The Knott has an excellent jukebox and as much as I would have liked to settle for another and some fine music….we have to move on. The Golfing crew headed to their 9th hole The Atlas opposite The Knott. However, we were destined to walk other fairways to….. This bar is incredibly deceptive. The entrance and the frontage is so small, you could easily walk past. I’ve been a few times and nearly missed it tonight! Jukebox going strong, with The Black Keys juxtaposed with Joy Division….works for me! We settled down to the beer selection, 3 on tonight with Redwillow, Pictish and Facers. I opted for the Shameless from the mighty Redwillow Brewery of Macclesfield. This pale cracker is a double IPA at 5.9% abv. Aromas of hoppy apricots giving way to lovely creamy hop bitterness. I don’t know what hops Mr Mackenzie put in this, but I detected more apricot and American hoppy flavours. A lovely beer and, notwithstanding the darks that come later, the best beer of the evening for me. With beers like this, I could be brought over from The Dark Side!!! The other 4 had the Pictish Brewers Gold, which was enjoyed hugely. Cask deserves more than one pint to be drunk, but, being a ‘stroll’……..
Quick scan of the bar reveals 4 ales on, but my eyes went no further that Conwy Brewery Honey Porter. 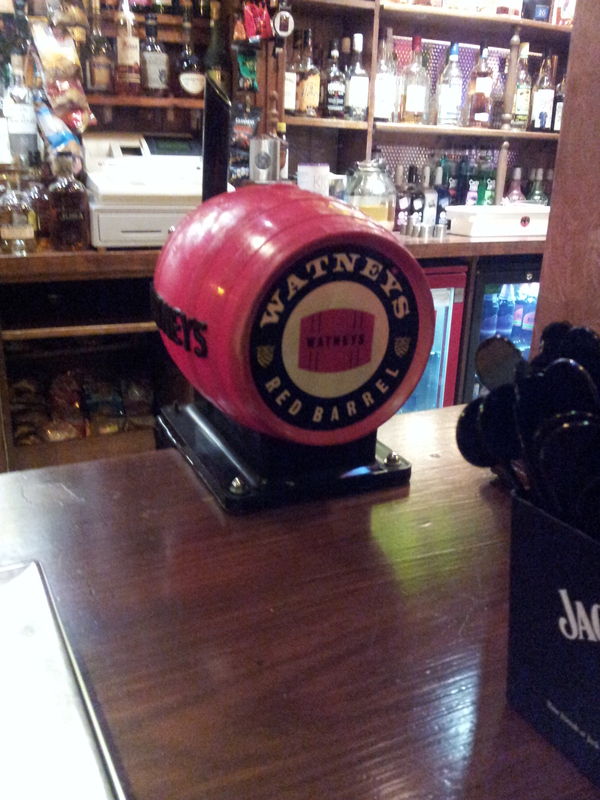 Never had a Conwy on draught (though have had some bottles). We got the beers and settled in the corridor behind the bar as the other two rooms were quite busy too. This pub is a decorative gem with all this wood and stained glass! Simply gorgeous. I could come in even if the beer was pants…which it certainly wasn’t! 3 went for the Conwy, 2 went for the Coach House Farriers Best Bitter. The Conwy is a dark brown porter. Some honey sweetness on the nose along with the dark roasted malt. The flavour was slightly honeyed, not sweet at all with a lovely smooth texture and nice roasted taste with a slight bitterness in the finish. A really nice subtle beer. I’ll be looking out for Conwy draught products again! With all these people in the bar it was damn HOT! I was sweating like Lee Evans in a sauna!!! We needed to get into the cool night air and (passing the Peveril – another evening, maybe) we headed to…..
No need for descriptives for this fine Wetherspoon emporium. Straight to the bar. DARK HEAVEN! As well as the (Elland) Paramount Porter, there was Greenfield Black 5 AND Titanic Plum Porter! I was struggling to choose. But opted for the Titanic. Plums? Tick! Roasted Malt flavours? Tick! Good value at £2.09? Hell yes! Another excellent draught beer from the ever reliable Stoke brewers. (Just waiting for some more Chocolate & Vanilla Stout on draught please!!!). What’s this I see? All 5 strollers drinking dark beer? Heavens to Murgatroyd!!!! The inevitable second beer in this fine hostelry was a doozy for me. Paramount Porter. 6.5% of Porter heaven. Creamy, slightly bitter, licorice and coffee roast. This is a 5 star beer at a 1 star price. £2.40!!! Getting late. Chris, being off to Hamburg on a jolly on Friday morning, was dropped at St Peters Sq Metrolink. I fancied one more at Waterhouse, but was outvoted. Let’s just say, it got messy, buses were missed…….TAXI!